We are already through a full week in October. Time flies by so quickly and the older I get the quicker it goes by. September went by so fast it is just a blur so I had to remind myself what I did in September by looking back through my posts and I'm sharing some of them here just in case it was all a blur to you, too. My open shelving in the kitchen was restyled a bit after adding to my vintage collectibles. 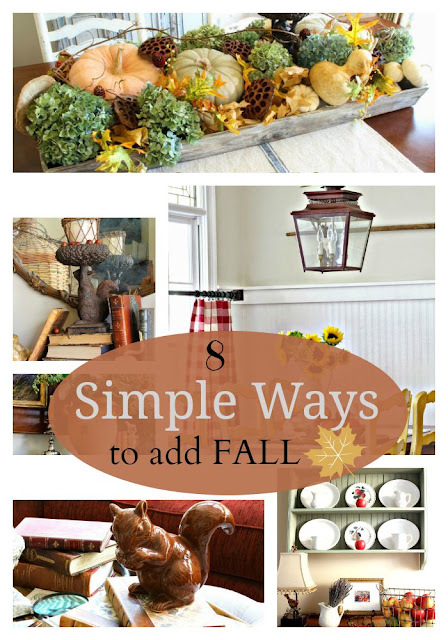 I shared 8 Simple Ways to Add Fall from past fall posts. Velvet, Ironstone and Silver works well together in this fall vignette in the dining room plus there was a giveaway that is long over. I took y'all along on an apple picking trip and shared why I needed fresh picked apples. The deck was dressed for fall by bringing some things from the indoors out. My fall mantel was very simple. Candlesticks were made over with layers of paint. Another paint project since I was really in the mood to paint was this caned bench I found at a consignment store. Fall was added to the great room by decorating with nature. Let's dine alfresco on the deck in fall style. Another paint project was this pine chest that got a coat of milk paint in Mora. The details were really brought out with paint on this set of candlesticks. The sitting room was made cozy for fall. Whew, and that's a wrap! You certainly had a great month of creative design and finds. A beautiful way to start the Fall season. Each post was wonderful. I am so glad you are enjoying your new "outdoor room'!!! I love all of your Fall designs! I enjoyed this recap! Great recap. September was a blur for me too. It went by so fast! You had a very productive month. Your home is now all cozied up for fall. Such a beautiful reminder of all you have created, built, styled and shared. Everything you inspire is over the top with Awww inspiring wowness! See more of you in late October I am sure, and looking forward to what winter brings us.